The fenestron of a Eurocopter EC135, with uneven blade spacing to control noise emissions. A Fenestron (sometimes alternatively referred to as a fantail or a "fan-in-fin" arrangement) is a protected tail rotor of a helicopter operating like a ducted fan. The term Fenestron is a trademark of multinational helicopter manufacturing consortium Airbus Helicopters (formerly known as Eurocopter). The word itself comes from the Occitan term for a small window,[N 1] and is ultimately derived from the Latin fenestra word for window. The Fenestron differs from a conventional tail rotor by being integrally housed within the tail unit of the rotorcraft and, like the conventional tail rotor it replaces, functions to counteract the torque of the main rotor. While conventional tail rotors typically have two or four blades, Fenestrons have between eight and eighteen blades; these may have variable angular spacing so that the noise is distributed over different frequencies. By placing the fan within a duct, this results in several distinct advantages over a conventional tail rotor, such as a reduction in tip vortex losses, the potential for substantial noise reduction, while also shielding both the tail rotor itself from collision damage and ground personnel from the hazard posed by a traditional spinning rotor. It was first developed for use on an operational rotorcraft by the French company Sud Aviation (now part of Airbus Helicopters), being first adopted upon the Aérospatiale Gazelle. Since then, the company (and its successors) have installed fenestrons upon many of their helicopters. Other manufacturers have also made limited use of the Fenestron on some of their own products, including the American aerospace corporation Boeing, the Russian rotorcraft manufacturer Kamov, and Japanese conglomerate Kawasaki Heavy Industries. The concept of the Fenestron was first patented in Great Britain by the Glaswegian engineering company G. & J. Weir Ltd. It was designed by British aeronautical engineer C. G. Pullin as an improvement to helicopters in British patent number 572417, and is registered as having been filed during May 1943. At that time, Weir had been participated in development work for the Cierva Autogiro Company, who was the holding company for the patent. In concept, the invention was to function as a viable replacement for the conventional tail rotor arrangement, aiming to produce improvements in both safety and performance upon such equipped rotorcraft. However, this early work in Britain would not directly lead to any released product by Cierva making use of this innovation. Instead, the Fenestron would only be further developed during the 1960s by an unrelated company. The Fenestron was first practically applied by the French aircraft manufacturer Sud Aviation, who had decided to introduce it upon the second experimental model of their in-development SA 340 (the first prototype had been furnished with a conventional anti-torque tail rotor). The SA 340's fenestron was designed by French aerodynamicist Paul Fabre; unusually, this unit had its advancing blade set at the top in defiance of conventional practice, but this was reasoned to pose little impact upon this particular helicopter. Fitted accordingly, on 12 April 1968, the SA 340 became the first rotorcraft to fly using a Fenestron tail unit. Having been determined to have been satisfactory, this tail unit was retained and was put into production on a refined model of the rotorcraft, which was designated Aérospatiale SA 341 Gazelle. Over time, the design and performance of the Fenestron has been improved by Sud Aviation and its successor companies, as well as by other companies. During the late 1970s, Aérospatiale (which Sud Aviation had merged into) launched a second generation all-composite unit; it primarily featured a reversal of the blade's direction of rotation as well as adopting a 20 per cent larger diameter duct for greater efficiency. This unit was fitted onto the Aérospatiale SA 360 Dauphin, along with its more successful AS365 Dauphin model and its derivatives. While further flight experiments were conducted using an even larger Fenestron upon an SA 330 Puma medium lift helicopter around the same time frame, it was concluded that there were practical limits to how large a helicopter such a configuration would be suited to, and production examples of the Puma retained a conventional tail rotor instead. During the 1990s, a third generation Fenestron was produced by Eurocopter (Aérospatiale's multinational successor), equipped with unevenly-spaced blades in order to optimize its noise levels; this unit was first fitted onto the company's EC135 helicopter, and was later incorporated into the designs of the EC130 and the EC145, the latter of which having original been produced for over a decade with a conventional tail rotor. During the 2010s, multinational helicopter manufacturer Airbus Helicopters (a rebranded version of the Eurocopter entity) developed the Fenestron further for their new H160, a medium-twin sized rotorcraft; in this revision, the fan duct was intentionally sloped by 12 degrees to achieve improved performance and greater stability when being operated with higher payloads and flown at lower speeds. According to aviation author Ray Proudy, in a typical implementation, a Fenestron is normally paired with a larger vertical stabiliser unit that also performs the role of compensating for torque; this configuration has the effect of reducing wear on the Fenestron blades and transmission system, which in turn leads to maintenance savings. Furthermore, the adoption of larger diameter units, while posing some engineering challenges, normally increases their efficiency and decreases their power requirements. Advanced implementations of the Fenestron are provisioned with stators and adjustable weights in order to optimise the blades for a reduction in power required and pitch control loads imposed. During the 2010s, Airbus Helicopters stated that it expected the Fenestron to continue to be refined to suit rotorcraft of increasing tonnages and for further innovations to be made in the field. Through multiple mergers from Sud Aviation to Airbus Helicopters, a considerable number of light, intermediate, and medium weight helicopters have used the Fenestron as an anti-torque tail rotor. Such implementations can be found on many of Eurocopter's helicopter range, such as the Eurocopter EC120 Colibri, EC130 ECO Star, EC135 (and EC635, the military version of the EC135), EC145, the AS365 N/N3 Dauphin (also built as the HH-65 Dolphin, a dedicated variant used by the United States Coast Guard, and the license-built Harbin Z-9), and the enlarged EC155 Super Dauphin (a wider, heavier and more advanced version of the AS365 N/N3 series). Other than Airbus Helicopters and its predecessors, other companies have also made use of Fenestron anti-torque arrangements. One such rotorcraft was the American Boeing/Sikorsky RAH-66 Comanche, a stealthy aerial reconnaissance helicopter which was canceled in 2004. 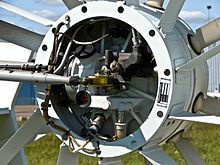 Ducted fan tail rotors have also been used in the Russian Kamov Ka-60 medium-lift helicopter, and also on the Japanese military's Kawasaki OH-1 Ninja reconnaissance rotorcraft. French light helicopter manufacturer Hélicoptères_Guimbal has also used a Fenestron for their Guimbal Cabri G2, a compact reciprocating engine-powered rotorcraft. A decrease in power requirements during the cruise phase of flight. Enhanced anti-torque control efficiency and reduction in pilot workload. A higher construction and purchasing cost. An increase in power required during the hover phase of flight. ^ Born in Aix-en-Provence and fiercely loyal to his roots, Paul Fabre chose the name fenestrou, a Provencal word meaning small round window, to designate his shrouded rotor invention. ^ A computational simulation has suggested that the maximum achievable thrust of a Fenestron is twice as high and at identical power, thrust was slightly greater than for a conventional rotor of the same diameter. ^ Leishman 2006, p. 321. ^ a b c d e Colonges, Monique. "History of the fenestron." Airbus Helicopters, Retrieved: 16 April 2018. ^ Prouty, Ray. Helicopter Aerodynamics, Helobooks, 1985, 2004. p. 266. ^ a b c d e f g Huber, Mike. "The Fenestron Turns 50." AIN Online, 12 April 2018. ^ Corda 2017, pp. 33–34. ^ Leishman 2006, p. 324. ^ "Publication Number: 572417 - Improvements in helicopters." patentscope.wipo.int, 24 May 1943. ^ a b Prouty 2009, p. 266. ^ a b Prouty 2009, p. 267. ^ a b c "Cabri G2 Fenestron." collegeaviationdegree.com, Retrieved: 16 April 2018. ^ "Fenestron, the Origins: Episode One." Airbus Helicopters, 12 April 2018. ^ "Airbus Helicopters’ new EC145 T2 is certified." Airbus Helicopters, 17 April 2014. ^ a b Prouty 2009, pp. 266–267. ^ Leishman 2006, p. 46. ^ a b Gey 2004, p. 180. ^ Leishman 2006, pp. 315, 321. ^ "Hover and wind-tunnel testing of shrouded rotors for improved micro air vehicle design." pp. 65–66. University of Maryland, 2008. Retrieved: 15 March 2013. ^ "More innovation with Eurocopter’s signature tail rotor." Airbus Helicopters, 8 March 2011. ^ Corda 2017, p. 34. ^ Johnson 2013, p. 282. Gay, Daniel. Composite Materials: Design and Applications. CRC Press, 2014. ISBN 1-4665-8487-4. Johnson, Wayne. "Rotorcraft Aeromechanics." Cambridge University Press, 2013. ISBN 1-1073-5528-1. Newman, Ron. The Technical, Aerodynamic & Performance Aspects of a Helicopter. BookBaby, 2015. ISBN 1-4835-5878-9. Prouty, Ray. Helicopter Aerodynamics Volume I. Lulu.com, 2009. ISBN 0-5570-8991-3. This page was last edited on 20 February 2019, at 17:25 (UTC).